It’s November and everybody’s running around trying to close deals, finish projects, and hire new employees so they can meet their annual goals. It’s easy to get caught up in that frenzy, and so it’s important to remember that this is also a good time of year to slow down and be thoughtful. During my morning journaling recently, I took a few moments to think about all the people who help me in my business – my support system, if you will: Tony, Sharon, Suzan, Peter, Pete, Marijo, Evelyn, and Eleanor, who make everything run smoothly behind the scenes, keep me out of trouble, and help move things forward; my clients, who help me grow and learn as we explore what’s possible and move into action; everyone who refers business to me – past and current clients, networking buddies, fellow coaches, business colleagues, friends, and family. I didn’t reach this place on my own, and I’m thankful for each and every one of these people. While I was journaling, I noticed something funny happening in my body. I felt good. I felt positive and optimistic. Being grateful can actually increase the level of activity in your hypothalamus, the area of the brain that influences your metabolism and stress levels. It also activates the region associated with dopamine, the “reward” chemical. Your body wants more of that, so you continue to give and receive gratitude. It’s a nice mind-body loop. 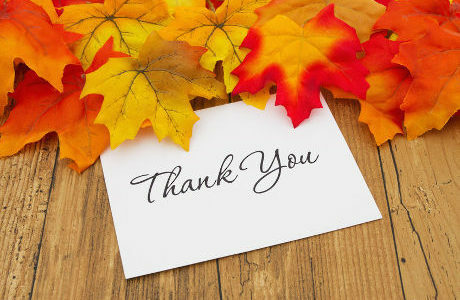 And there are even more benefits to giving thanks, especially to your employees. Did you know that the single highest driver of employee engagement, according to a worldwide study, is whether or not workers feel their managers are genuinely interested in their well-being? Being recognized and appreciated at work makes people feel safe, creates job satisfaction, and leads to happier employees. An engaged employee is less likely to leave your company. One of the best ways to show interest in your employees is to acknowledge them for a job well done. And when you thank them, be specific. Like a performance review, a commendation is more valuable when it includes details. Stating exactly what the person did and what it meant to you and your company is the most powerful way to deliver your message. People want to feel they’re making a difference at work. Just saying “thanks” is a simple and surprisingly effective way to meet this need. 1. Start by identifying the tools that help you do your job. The phone that keeps you connected. The car that gets you to work. A speedy Internet connection. Make a list of five things that make your life easier and take a moment to give thanks for each one. Now observe how you’re feeling. 2. Next, look outside of yourself. Make a list of the people who help you and your company — your employees, your vendors, your colleagues. Here are some others you may wish to add. 3. Now think about what you could say to each of those people. Be specific. How exactly have they helped you, your team, and your company? 4. Consider how you might acknowledge them. You could do it publicly at the next meeting, include a note in the company newsletter or team email, or send them a warm handwritten note. 5. Go share your thanks! Many families have a tradition of expressing their gratitude at the Thanksgiving table. Why not bring this practice to your company and offer thanks around the conference room table? What effect might this have on you and your team?